Is Your Company’s Vacation and Holiday Policy Working as Planned? Presumably you have a holiday and vacation policy already in place. But what if it’s not working well for your company or your employees? For example, if it’s vague, you may have to make decisions on the spot when an employee asks for days off at a time that is inconvenient for you and possibly for other members of your team. That can result in hard feelings if you have to say no, or extra work for you and others if you feel compelled to approve the request. In constructing a policy, while it’s useful to consider what a perfect world would look like from your perspective, it’s also essential to begin with considering what other employers in your labor market are doing. That way you can be sure you’re reasonably competitive without giving away the store (see “Is Your Holiday Policy Competitive” below). 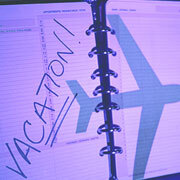 A solid vacation policy will spell out the requirements for submitting time-off requests. For example, you might choose to give employees greater freedom to choose days off the further in advance they make the request. The more lead time you have to plan around vacation schedules, the less of a burden an employee’s absence imposes on you and your team. Workers who make last-minute requests should know that they may be turned down. To avoid misunderstandings, define what your company means by last minute. Depending on the complexity of your scheduling, it could mean two days in advance, or two weeks or even more. It’s also important to set a policy that establishes priority, when more than one employee asks for vacation leave for the same period of time. If three key people from a six-member department all want to take the last two weeks of August, who gets priority? Basic prioritization systems include seniority, and first-come-first-served, or some combination of those two. A third option is a rotational scheme. This involves having a team agree to make their vacation scheduling requests at the same time. Employees are randomly assigned a number indicating place in the request sequence, such as a number between one and six for a department of six. The six employees then get to make their vacation requests according to the number they choose. But the employee who drew the number one moves to the end of the line (to number six) in the next round, number two moves up to number one, and so on. If your company experiences annual slow periods, you may choose to encourage employees to take vacations during slow periods. That encouragement could take the form of a requirement that half of employees’ vacation time be used during such slow periods. However, for employees with children, school vacation schedules will be a major consideration, and you’d want to be as accommodating as possible for those workers, without leaving yourself open to an accusation of favoritism. Some companies elect to go into a “hibernation” mode during a traditionally slow period, and essentially shut the place down, requiring employees to use most of their vacation days at that time. This is a common practice in several European countries. Employees plan around it, and nobody is left holding the bag, having to pick up the slack caused by other employees’ vacation schedules. Finally, if your workforce is cooperative and flexible (or you’re working to make it so), consider trying a collective process for setting vacation schedules. In other words, let a team work things out among themselves, taking into consideration each other’s needs and priorities, as well as the effectiveness and productivity of the team as a whole. Your role is to stay out of the discussions as much as possible, empowering team members to come up with their own solutions. Avoiding having to play the role of heavy. Remember, establishing a vacation and holiday policy involves a balancing act between the operational needs of the business and employees’ desires. The process may be more of an art than a science. It’s up to you to find that proper balance. Is Your Holiday Policy Competitive? According to the Society for Human Resource Management (SHRM) 2017 survey, most employers pay a premium to employees when they are asked to work on holidays. Among those that do, 40% pay double-time wages to non-exempt workers, and 21% pay time-and-a-half. Relatively few allow employees to take a floating holiday — that is, the opportunity to pick an alternative day off to a standard holiday, such as taking July 5 off instead of July 4. Similarly, only about 18% allow full-time employees to swap holidays, for example, take Chinese New Year’s day off in lieu of January first. In case you’re wondering how your company’s holiday policy stacks up to other companies, here are the results of a 2017 SHRM survey, entitled Holiday Recognition Prevalence. Are You Risking the Trust Fund Penalty for Unpaid Payroll Taxes?